The 2017 FIFA U-17 World Cup was the 17th FIFA U-17 World Cup, a biennial international football tournament contested by men's under-17 national teams. Organized by FIFA, the tournament took place in India between 6 and 28 October 2017, after the country was awarded the hosting rights on 5 December 2013. The tournament marked the first time India have hosted a FIFA tournament and the first Asian country to host U-17 World Cup since 2013. The attendance for this World Cup was a record 1,347,133 surpassing China's record in 1985 with 1,230,976. The matches were played in six stadiums in six host cities around the country, with the final taking place at the Salt Lake Stadium in Kolkata, West Bengal. Twenty-three teams, besides the host India, managed to qualify for the tournament via participating in their various continental under-17 tournaments. In the first round of the tournament finals, the teams competed in round-robin groups of four for points, where the top two teams in each group along with the top four third placed teams would advance to the next round. These 16 teams will advance to the knockout stage, where three rounds of play will decide which teams would participate in the final. The reigning FIFA U-17 World Cup champions, Nigeria, did not have the opportunity to defend their title after failing to qualify for this edition. In failing to qualify, Nigeria became the first incumbent title holder since Switzerland in 2009 to fail to qualify for the subsequent edition. England won the U-17 World Cup for the first time after coming back from a two-goal deficit and beating Spain 5–2 in the final. This meant England became the second nation, after Brazil in 2003, to win both of FIFA's under-age (U-20 and U-17) World Cup tournaments in the same calendar year. England has also become the third country, after Brazil and North Korea, to win both U-17 and U-20 World Cup in their respective gender tournaments on the same year, as North Korea had also won both U-17 and U-20 Women's World Cup last year. The Official Match Ball of the Tournament is Adidas Krasava. The bids for the 2017 FIFA U-17 World Cup had to be submitted by 15 November 2013. On 28 May 2013 it was announced by FIFA that Azerbaijan, India, Republic of Ireland, and Uzbekistan would bid for the hosting rights. Finally, on 5 December 2013, FIFA announced that India had won the 2017 FIFA World Cup hosting rights. As host, India made their first ever appearance at the FIFA U-17 World Cup and their first appearance in the World Cup at any age level. As well as India, New Caledonia and Niger also made their first appearance in the FIFA U-17 World Cup. The previous U-17 World Cup title holders, Nigeria, failed to qualify for this edition. In failing to qualify, Nigeria became the first nation since Switzerland in 2009 to fail to qualify for the next edition of the FIFA U-17 World Cup after winning the previous edition. A total of 24 teams qualified for the final tournament. In addition to India, the other 23 teams qualified from six separate continental competitions. Starting from 2017, the Oceania Football Confederation (OFC) will receive an additional spot (in total two spots), while UEFA will have five instead of six spots. 1.^ Teams that will make their debut. The six venues selected for the tournament were given major renovations prior to the FIFA U-17 World Cup. All the stadiums were given new bucket seats, new dressing rooms, new evacuation exits for fans, and new training grounds. Javier Ceppi, the Local Organising Committee director, stated that despite work starting slowly, things eventually became quicker. "It has been a long process in the last two and half years. In India, it takes time to start things but once things start it kind of picks its own pace and in terms of implementation I always say that India is a very good country when it comes to implementation." The official emblem for the tournament was launched on 27 September 2016 at a hotel in Goa during the 2016 AFC U-16 Championship. According to the press release from FIFA the emblem was designed "as a celebration of the country’s richness and diversity of cultures, with the main elements of the Indian Ocean, the banyan tree, the kite and the starburst, which is an interpretation of the Ashoka Chakra, an integral part of the national identity." Sales of tickets for the FIFA U-17 World Cup began on 16 May 2017 during a function in New Delhi. Carles Puyol was present during the ticket sales launch as special guest. General ticket sales officially began on 17 May 2017 at 19:11. The time was selected as a tribute to when Mohun Bagan defeated East Yorkshire Regiment in the IFA Shield in 1911, marking the first time an Indian football club defeated a British side in British India. Tickets for the tournament were sold in four phases: Phase one only sold tickets for categories 1 to 3 at each venue with a 60% discount while phase two allowed people to buy tickets for all categories, but only if you are a Visa card holder, at a 50% discount. Phase three allowed anyone to buy tickets with a 25% discount while phase four had tickets at full price. The attendance for matches breached the million mark in the final match of the Round of 16, which made India only the third nation after China and Mexico to register an attendance of over a million for the event. On 28 October 2017, in the 3rd place match-up between Brazil and Mali, India finally beat the existing record of 1,230,976 set in the 1985 FIFA U-16 World Championship edition in China The final attendance figures were 1,347,133. After being awarded the hosting rights for the FIFA U-17 World Cup, eight locations were shortlisted: Bangalore, Guwahati, Kochi, Kolkata, Margao, Navi Mumbai, New Delhi and Pune.On 29 May 2015, Kochi, Mumbai, Kolkata and Guwahati were provisionally selected as host locations and was informed two more would be provisionally approved from the list of Bengaluru, Chennai, Goa, New Delhi and Pune . On 27 October 2016, FIFA officially announced Guwahati, Kochi, Kolkata, Margao, Navi Mumbai and New Delhi as the official host cities for the FIFA U-17 World Cup. The draw for the FIFA U-17 World Cup was held on 7 July 2017 in Mumbai. The draw was attended by former U-17 World Cup champions Nwankwo Kanu (Nigeria) and Esteban Cambiasso (Argentina), as well as India senior international Sunil Chhetri and badminton player P. V. Sindhu. The 24 teams were drawn into six groups of four teams, with hosts India being allocated to position A1. The rest of the teams were allocated into their respective pots based on a ranking which was built according to past performances during the last five FIFA U-17 World Cups. Importance was given to the most recent U-17 World Cups. FIFA's Referees' Committee selected 21 referees, representing all six confederations, to officiate at the U-17 World Cup: Seven from UEFA, four from CONMEBOL, three each from the AFC, CAF, and CONCACAF, and one from the OFC. No referee from host country India were selected to officiate. Each team's squad for the FIFA U-17 World Cup consisted of 21 players. Each participating national association had to confirm their final 21-player squad by 21 September 2017. A total of 504 players participated in the tournament. The squads were announced by FIFA on 26 September 2017. All times are local, IST (UTC+5:30). ^ a b Ranked by disciplinary points (New Zealand: –6 pts; Guinea: –9 pts). In the knockout stages, if a match is level at the end of normal playing time, no extra time shall be played and the winner shall be determined by a penalty shoot-out. FIFA released the media licensing rights for the U-17 World Cup on 21 September 2017. In India, the official broadcaster is Sony TEN and Sony ESPN. In the United States, the tournament is being broadcast on Fox Sports 2 while the United Kingdom has the tournament broadcast on Eurosport. The 2017 FIFA U-17 World Cup was regarded as a success by the media, FIFA and the tournament organisers. Jaime Yarza, Head of FIFA Tournaments, said, "It's been a fantastic tournament with an overwhelming response of everybody involved. First and foremost, the fans have filled the stadiums in all the matches, showing fair play and respect, cheering on all the teams, and really loving the football they have seen. The figures speak for themselves: more than 1.2 million fans attended games at the stadiums. By the final matchday, we’re probably going to break the [attendance] record of all the other U-17 World Cups and we might even break the record for the U-20 World Cup, which is an amazing achievement. It really shows that India is a footballing nation in every sense. The hard work put in place during so many years has received a great response from everybody. It has been a very proud moment for all of us." The tournament was the most attended and highest scoring edition of the FIFA U-17 World Cup in history. It was also the highest attended men's age-group World Cup ever, surpassing the attendance record of the FIFA U-20 World Cup. The attendance for this World Cup was a record 1,347,133 surpassing China's 1985 edition where it was 1,230,976, and the 2011 U-20 World Cup in Colombia which was attended by 1,309,929 people. The 177 goals scored during the tournament made it the highest scoring U-17 World Cup in history, surpassing the previous record of 172 during the 2013 edition in the United Arab Emirates. The 2017 FIFA U-17 World Cup also recorded the highest goal average of 3.40 per match since the tournament format was expanded from 16 teams to 24 teams in 2007. In September 2017, India submitted a bid to host the 2019 FIFA U-20 World Cup, but lost to Poland. India was selected to host the 2020 FIFA U-17 Women's World Cup by the FIFA Council on 15 March 2019. 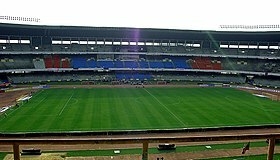 ^ The venue of the first semi-final was moved to Salt Lake Stadium, Kolkata, following assessment of the pitch conditions of the original venue, Indira Gandhi Athletic Stadium, Guwahati, which had been affected by severe rainfall. ^ "England Under-17s overwhelm Spain to land spectacular World Cup win". Guardian. 28 October 2017. Retrieved 31 October 2017. ^ "England double up by winning U17 World Cup". UEFA.com. 28 October 2017. ^ "England win U17 World Cup: Young Lions fight back to beat Spain in final". BBC Sport. 28 October 2017. Retrieved 31 October 2017. ^ "Bidding process opened for five FIFA competitions in 2016 and 2017". FIFA. 17 April 2013. Retrieved 1 October 2017. ^ "FIFA Executive Committee fully backs resolution on the fight against racism and discrimination". FIFA. 28 May 2013. Retrieved 1 October 2017. ^ "Official: India to host U-17 World Cup in 2017". Goal.com. 5 December 2013. Retrieved 1 October 2017. ^ "At the FIFA U-17 World Cup, an Indian style of football will finally kick off on the global stage". Economic Times. 16 September 2017. Retrieved 2 October 2017. ^ Easwar, Nisanth (27 September 2017). "How did the teams fare in their first FIFA U-17 World Cup appearance". Goal.com. Retrieved 2 October 2017. ^ "Niger Republic U17 3–1 Nigeria U17: Golden Eaglets crash out of U17 Afcon". Goal.com. 20 August 2016. Retrieved 2 October 2017. ^ "FIFA executive vows to improve governance and boost female participation in football". FIFA.com. 25 September 2015. ^ a b "FIFA U-17 World Cup 2017: An interactive look at the facelifts the six stadiums have received". FirstPost. 28 September 2017. Retrieved 2 October 2017. ^ "'Infrastructure ready for FIFA U-17 World Cup'". The Hindu. 17 February 2017. Retrieved 2 October 2017. ^ a b "Official Emblem launched for FIFA U-17 World Cup India 2017". FIFA. 27 September 2016. Retrieved 2 October 2017. ^ a b "Fifa U-17 World Cup 2017: Carles Puyol kicks off ticket sales, honours Mohun Bagan icon". FirstPost. 16 May 2017. Retrieved 2 October 2017. ^ "Tickets for India 2017 now available". FIFA. Retrieved 2 October 2017. ^ "India could shatter Under 17 World Cup attendance record - Times of India". The Times of India. Retrieved 23 October 2017. ^ "FIFA U-17 WC in India becomes most attended in event's history". ^ Vikraman, Deepak. "India to Host 2017 U-17 FIFA World Cup". IBTimes. Retrieved 2 October 2017. ^ "Under-17 World Cup schedule clashes with ISL, FIFA not ready to alter". Indian Express. 29 May 2015. Retrieved 2 October 2017. ^ "India 2017 continues to take shape". FIFA. 27 October 2016. Retrieved 2 October 2017. ^ a b c d e f "FIFA Stats" (PDF). FIFA. ^ a b "Relive the India 2017 draw with FIFA.com". FIFA. 7 July 2017. Retrieved 3 October 2017. ^ a b c "Draw procedures" (PDF). FIFA. ^ a b "FIFA Match Officials" (PDF). FIFA. ^ a b "FIFA U-17 World Cup: When is the last date for teams to submit final squads". Goal.com. 15 August 2017. Retrieved 3 October 2017. ^ "Talented youngsters set for Indian odyssey". FIFA.com. 26 September 2017. ^ "FIFA U-17 World Cup India 2017 – List of Players" (PDF). FIFA.com. ^ a b c d "Regulations – FIFA U-17 World Cup India 2017" (PDF). FIFA.com. ^ "Match Schedule FIFA U-17 World Cup India 2017" (PDF). FIFA.com. ^ "FIFA U-17 World Cup semi-final match to take place in Kolkata". FIFA.com. 23 October 2017. ^ Thomas (28 October 2017). "FIFA Referees News: 2017 FIFA U-17 World Cup - 3rd Place Match". refereesfifa.blogspot.com. ^ Thomas (28 October 2017). "FIFA Referees News: 2017 FIFA U-17 World Cup - Final". refereesfifa.blogspot.com. ^ "FIFA U-17 World Cup India 2017 – Awards". FIFA.com. ^ "FIFA U-17 World Cup India 2017 Media Rights Licenses" (PDF). FIFA. ^ "TV Guide: Date, time and where to get your football fix". Goal.com. 30 September 2017. Retrieved 3 October 2017. ^ "FIFA Under-17 World Cup: Fixtures, teams, TV & guide to India 2017". Goal.com. 30 September 2017. Retrieved 3 October 2017. ^ "A record-breaking World Cup shows India have finally embraced football". The Independent. 27 October 2017. Retrieved 17 February 2018. ^ "India 2017 hailed as a fantastic tournament". FIFA.com. 26 October 2017. Retrieved 17 February 2018. ^ a b "India hosts flawless Under-17 World Cup; players display quality on field". The Hindu. 29 October 2017. Retrieved 17 February 2018. ^ "'U-20 World Cup in India not a given' - Times of India". The Times of India. Retrieved 17 February 2018.